College ECCYC is from July 25th to 27th. 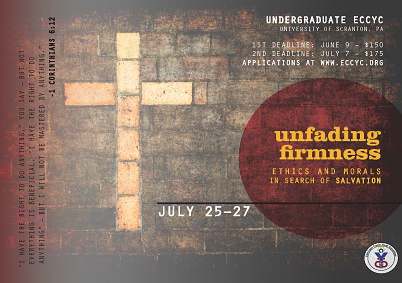 This year’s theme will focus on Ethical and Moral Dilemmas and how to live a moral life in an immoral world. Please register at the following site: https://www.eccyc.org/college-2/. Please contact Maggie Nakhla at 781-367-9224 or maggie9@gmail.com if you are planning to go so that we can arrange for transportation. Please feel free to forward this to anyone who might be interested! Next Friday night will be our final fellowship before Easter! The evening’s topic discussion will be on the Blind Man by Iriny Ekladious! After the discussion, we’ll grab dinner together at Bangkok Blue http://www.bkkblueboston.com/. Please RSVP if you can make it so we can make reservations! We will start prayer at 7:30pm and plan to be heading to dinner by 8:45. We hope that you are having a wonderful and blessed Lent and we look forward to seeing you there … If you have any questions, please let us know! 3.7 Friday Night Fellowship & Dinner at Chili Duck Thai! Join us this Thursday for Tasbeha in Boston! We will start at 9 PM this Thursday at the Paulist Center. Please know we will have Tasbeha in Boston every other Thursday from now until May. The entrance of the church is marked by 2 sets of red doors. Hope you can make it! 2.7 Friday Night Fellowship & Dinner at PF Chang’s! 1.30 Midnight Praises -&- 2.1 Divine Liturgy in Boston! I hope you are well and I would just like to let you know about the following services this week. Midnight Praises will resume this Thursday (January 30th). We will meet at the Paulist Center from 9-11pm. The Paulist Center is located on 5 Park Street in Boston, right off the Park Street T Stop on the Green/Red Lines! We will also be celebrating the Divine Liturgy in Boston on Saturday (February 1st) at the Paulist Center from 8:30 to 10:30am! Any questions, please respond or contact any of the servants or post here. See you there! We would like to encourage you to join us in prayer at this event this Saturday at 2pm in Boston at The Basilica of Our Lady of Perpetual Help. It’s an Ecumenical Prayer for all Christian Martyrs. Cardinal Sean will preside at an Ecumenical Prayer for the Martyrs, organized by the Community of Sant’egidio & the Office for Ecumenical and Interreligious Affairs. They invite you to an unprecedented ecumenical prayer in the Week of Prayer for Christian Unity which gathers the leaders of Christian traditions from across the Boston area in memory of all those who gave their lives for the Gospel, on￼ Saturday, January 25th, at 2pm at Basilica of Our Lady of Perpetual Help (Mission Church), located at 1545 Tremont Street, Boston. Other Christian leaders who will lead in the prayer are Rev. Jeffrey Brown of Twelfth Baptist Church, Roxbury; Rev. Laura Everett, executive director of the Massachusetts Council of Churches; Rev. Hegoumen Moses of St. Mark Coptic Orthodox Church; Metropolitan Methodios of the Greek Orthodox Metropolis of Boston and All New England. If you have any questions, please contact Maggie at 781-367-9224.